POSTED Tue, 07/04/2017 - 16:00 | POSTED BY Traci C.
The 2017 Epcot Food and Wine Festival kicks off August 31 this year and runs for a record 75 days! We have some of the latest news in today's round-up including the return of ABC's The CHEW to the festival, and Eat to the Beat concert news. POSTED Wed, 05/03/2017 - 19:00 | POSTED BY Traci C.
The 2017 Epcot Food and Wine Festival doesn't start until August 31, but we're already getting some preliminary details. The Festival will run for a record 75 days and it will include a record 35 Marketplace Booths! POSTED Tue, 07/12/2016 - 16:00 | POSTED BY Traci C.
It's time to start planning your visit to the 2016 Epcot Food and Wine Festival! We have details on the marketplace booth menus, plus low-cost culinary seminars and demos. Let's dive in and see what this year's Festival has in store. POSTED Mon, 06/27/2016 - 01:00 | POSTED BY Traci C.
We have exciting and delicious news to share with you! With a mere 80 days left until the start of this year's Epcot Food and Wine Festival we have details on new marketplace booths, menu items, special events, and much more! POSTED Fri, 05/13/2016 - 20:15 | POSTED BY Traci C.
The 2016 Epcot International Food and Wine Festival kicks off September 14 for a record 62 days and we're getting a little more information about what we can expect this year. More than 30 festival marketplaces will be part of the festival along with culinary demos, special events, and more. 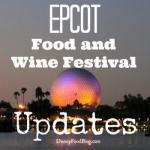 POSTED Fri, 07/17/2015 - 19:00 | POSTED BY Traci C.
If you're making plans to attend this 2015 Epcot International Food and Wine Festival you can now check out all the menus for the marketplace booths! New booths this year include Sustainable Chew, the Chew Lab, the Wine Studio, and the Cheese Studio. The Dominican Republic booth is returning after a multi-year hiatus. POSTED Wed, 07/15/2015 - 16:00 | POSTED BY Traci C.
It's that time of year again: time to start planning your visit to the 2015 Epcot International Food and Wine Festival. This year marks the 20th anniversary of the foodie fest and guests will have a chance to enjoy some new booths and special events. POSTED Fri, 05/30/2014 - 05:00 | POSTED BY Traci C.
This year's Epcot International Food and Wine Festival kicks off a week earlier than past festivals and will feature a new Patagonia booth, new menus, and special dining events. Debuting at this year's event is the Patagonia booth, which combines the flavors of Argentina and Chile. So far there is no word on whether or not the former Argentina and Chile booths will remain at the festival. The booth's menu will include dishes such as sustainable roasted Verlasso salmon, quinoa salad, and arugula chimichurri. When visiting the Epcot International Food and Wine Festival this year, you might notice something different about the locations when you're buying those tasty treats. Gone are the generic booths from years past. The new locations - called marketplaces, not kiosks - are mini kitchen outlets where chefs can create culinary magic every day. David Buckley, the art director for the festival, is behind much of the redesign. Do you plan for Food & Wine Festival? The winter holidays at Walt Disney World have delighted visiting guests for decades. One of my favorite more recent additions are the Holiday Kitchens at Epcot's International Festival of the Holidays. Tucked in around the 1.2 mile World Showcase promenade, guests will find charming culturally inspired kiosks serving up traditional holiday fare. Sights and sounds of cultures near and far entertain all who come, but it's the flavors of the holidays that keep me coming back. There are still a couple more amazing weeks to visit the Epcot International Food and Wine Festival. This annual fan favorite event is full of amazing tastes and sips to excite your palette and enhance your vacation. Many people are familiar with the extravagant dinners and parties that sell tickets for more than $100 a head, but that's just not within every budget. Since I've gotten recent questions on the subject I thought I'd pull this post out of the archives because knowing how you're going to pay for all that grub Food & Wine Festival is important business! The 2015 Epcot International Food & Wine Festival offers a veritable plethora of sip and tastes for you to indulge in, as well as tastings, seminars, and food and wine themes merchandise. Though it is called the Epcot International Food & Wine Festival - this annual event at Epcot is also an exciting spot to explore a whole new world of beer! Regular reader Erik H. wrote to us to say that as a new beer drinker the Festival has really opened up his horizons when it comes to beer. He's headed back down in October and wanted to know where to start his next exploration into the world of beer. So many exciting things have been happening over at the Disney Food Blog this weekend! There's a ton of information to share and we are helping to spread the word. Today they've got brand new 2013 Epcot Food and Wine Festival Details from the Tables In Wonderland Preview Dinner. Just another week now and the gates will open on the 20th Epcot International Flower and Garden Festival. This year guests will be treated to an invasion of Chefs with a world class Garden Marketplace featuring fresh and exciting culinary delights located at Marketplace booths around World Showcase.